It’s good to be here…again…taking you all on another Finnish weekend escape. We’re not travelling far from where we stopped in Savonlinna last weekend, and although some twenty-three kilometers away, the town of Kerimäki was consolidated with Savonlinna two years ago. But before we leave quaint Savonlinna, there’s somewhere I need to take you first—a park close to the center of town. My husband, Noel, and I had fun here creating our own “Where’s Wally” photos behind this huge bronze statue. Another interesting statue we found in Savonlinna was close to Olavinlinna Castle. Known as the “Spirit of the Castle,” this tall, full-figure metal statue is of Danish knight, Erick Axelsson Tott, clad in armor and gazing toward the castle he had founded—Olavinlinna. The statue was erected on the Tallisaari Island on the 500th anniversary of the castle. 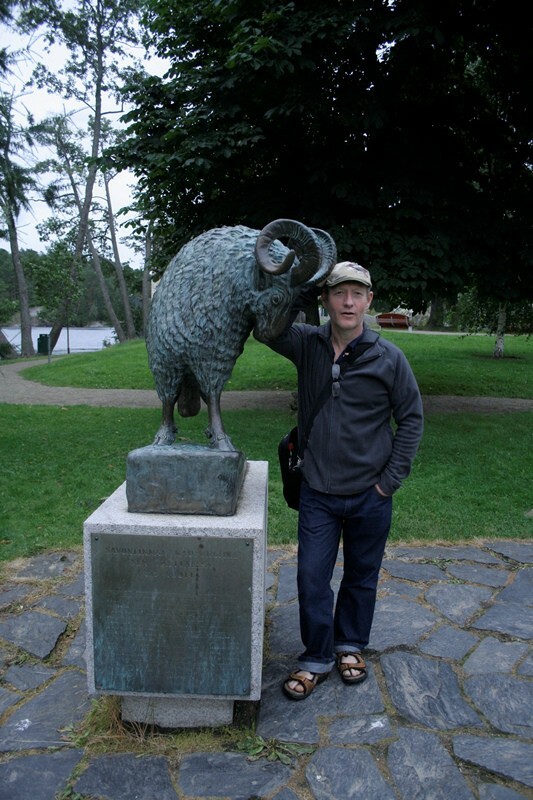 Another famous Savonlinna statue is “The Black Ram.” A black ram (or some other sheep) was kept in the castle. The ram was to be served on St. Olaf’s Day as a sacrificial feast, representing a bridge between old pagan traditions and Christian worship. The last ram of the castle died around 1728 by drowning in a river, marking the end of the tradition. 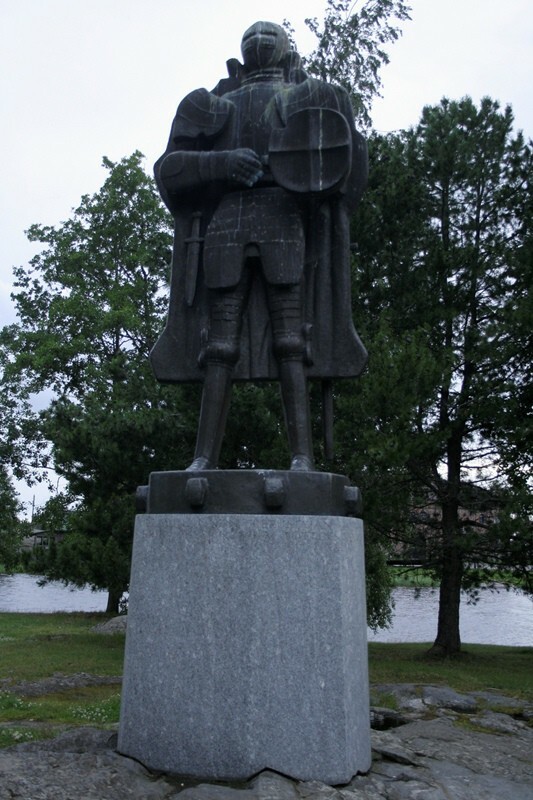 This statue was presented to Savonlinna on its 325th anniversary. If you’ll indulge me, I’d like to make one last stop at another statue before we head on over to Kerimäki. We had travelled twenty-five kilometers south from Kerimäki. About thirty kilometers (as the crow flies) before the Russian border, we found this fascinating statue outside Punkaharju at Lusto—the Finnish Forest Museum—of an old lumberjack and horse moving enormous logs. Isn’t the detail exquisite? In Kerimäki we stopped at a Finnish cemetery. Our friend wanted to visit her father’s grave. I’ve never been in such a beautiful and tranquil cemetery before. Uniformed headstones of even size and shape marked each grass-covered grave, while bright flowers brought color to the dark marble blocks. A forest of trees offered shade to the final resting place of the deceased. Not far from the cemetery, a tall, orangey-yellow and white wooden church reaches nearly thirty-seven meters into the sky. 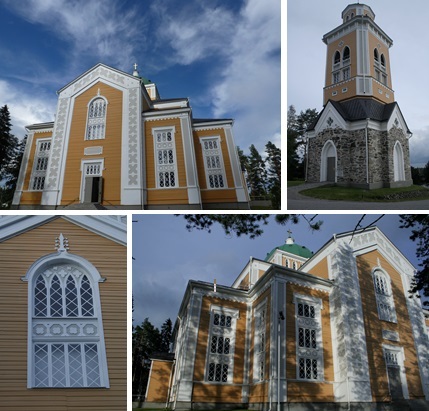 Built between 1844 and1847, the Kerimäki Church is the largest Christian wooden church in the world. With over 1670 meters of pews, the church seats over 3,000 people and with standing room can hold up to 5,000 at any given time. 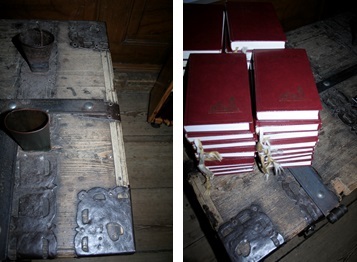 A short distance from the church there’s a gift shop housed in the bottom of the tower (see right hand insert below). 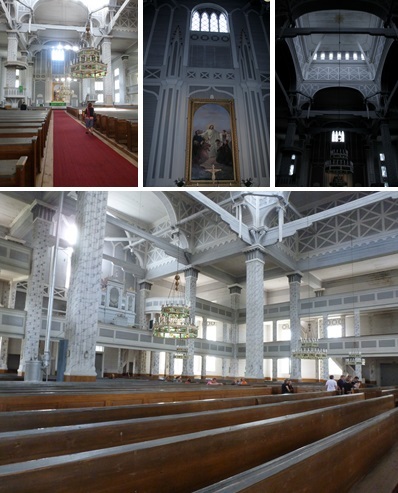 With its pews, columns, galleries, tie-beams, arches, domes and lanterns, this beautiful church is certainly a masterpiece of carpentry. Because the church can’t be heated, it’s only used in the summer for services, weddings, festivals and concerts. In 1953, a small church was built beside the huge church so that religious services could be held in the winter. But early on Christmas morning, parishioners gather in the old church and hundreds of candles fill the icy interior with a warm atmosphere. “Come to me all who labor and are heavy laden, and I will give you rest.” Contained in the altarpiece, these words of Jesus are the motto of the Kerimäki church. I loved the true story our friends told us when they took us to the Kerimäki Church of the year that black smoke was seen billowing out of the top tower. The fire brigade was called and the town’s people came to help put out the fire in this wooden church. When the firemen scoured the building they could find no sign of a fire, no smells of a fire, and yet the black smoke was a visible sign of one. Upon inspection up in the tower, they discovered the “black smoke” was actually swarms of mosquitos. In a blog on International Christian Fiction Writers, I wrote about the one thing I never expected in Finland…the infestation of mosquitos in the summer. Seems that year, even the Finns weren’t expecting it. I trust you’ve enjoyed your visits to Finland, sans mosquitos. In two weeks’ time, I’ll take you on an escape to beautiful Budapest. Hopefully soon, you’ll get to experience a different Finland with me—the winter wonderland including Santa’s home in Lapland. Helsinki Sunrise is available to purchase from Pelican Book Group, Christianbook.com, Amazon, and Barnes & Noble. MARION UECKERMANN’s passion for writing was sparked in 2001 when she moved to Ireland with her husband and two sons. 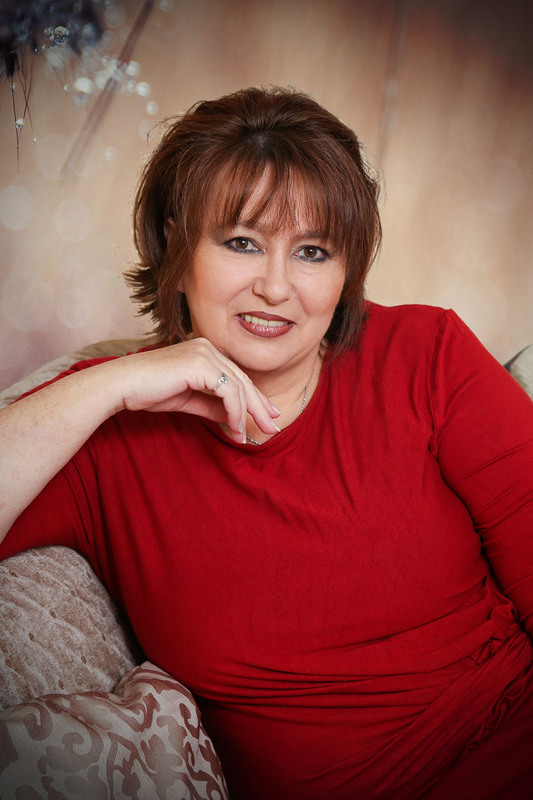 Since then she has published devotional articles and stories in Winners, The One Year Devotional of Joy and Laughter (Tyndale House Publishers), and Chicken Soup for the Soul: Miraculous Messages from Heaven, and her debut novelette, Helsinki Sunrise (White Rose Publishing, a Pelican Book Group imprint, Passport to Romance series). Her second Passport to Romance novelette, Oslo Overtures, will be published in 2015. Wonderful post. I loved especially Your statue photos – great. There was a coincidence with Your post and mine. I am presenting pauper statue collection in the church of Kerimäki and You show photos from it also. Of course I have made a post from Kerimäki church, but it is another story. That’s great, Sartenada. A very interesting post with great photos. Wish that exhibition had been at Kerimaki when we were there. Thanks, Marion 🙂 Lovely post today, and I’m looking forward to your Budapest post. I always enjoy the interviews with Mariam Ueckerman. She is a blessing to me. I always enjoy the interview with Marion and am looking forward to reading her books. I enjoy her sweet spirit. Thanks for your comment, Faith. Hope you’ll get to read Helsinki Sunrise soon. My next book in the series, Oslo Overtures, will release sometime in 2015. Loved this insight into Finland. What exquisite statues. Thanks Marion and Narelle! Thanks, Shirl 🙂 If you have a chance, take a peek at Sartenada’s blog at the link Marion posted in her comment. The photos of the statues, and their history, are just amazing. Thanks, Shirl. Finland has been a fascinating country to write about for Narelle’s weekend blogs. I look forward to sharing some of the winter wonderland next year. No doubt we’ll be experiencing a totally different Finland this year to the one we visited during the summer of 2012. I have been fondly imagining you live in Finland, but this last post disabused me of that notion! I have been to Finland 3 times between 2010 and 2012 and hope to visit again before I hang up my passport! Love the country, love the people. And love your posts that bring back wonderful memories.